So, it wouldn’t be surprising for FARC leaders or anyone to think that this could predispose Santos to more flexibility or ceding on issues as the clock on his presidency ticks closer toward its expiration. Whether President Santos likes it or not, he is being perceived (unfairly or not) as showing apparent signs of “over-anxiousness” for an overall peace accord, and this would presumably handicap him and weaken his own negotiating position. Pres. Santos would deny both that he is “over-anxious” and that he has handicapped himself. Moreover, Santos has said that what he does is “millimetricly” planned. But doubts about this were raised even among some of Pres. Santos’ own supporters, as well as among his critics, when breaking news of his out-of-the-blue Havana trip for the signing ceremony on victims and justice surprised the public and smacked to some of political overtones to give a big breath of air to the Colombian peace process a month before Colombia’s October 25 regional/local elections and to have big good news on the peace process before Pres. Santos spoke at the United Nations in late September. 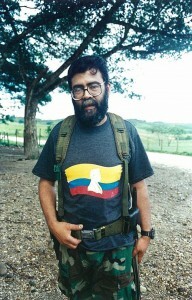 The FARC’s “Alfonso Cano” in the “Distension Zone.” Cano eventually became the maximum leader of the FARC, but was killed by soldiers in 2011. © Photo by Steve Salisbury. All rights reserved. The FARC received a big boost itself by having its maximum leader “Timochenko” standing together and shaking hands in a big flourish three-way with Pres. Santos and Raul Castro. Pres. Santos looked stiff and uncomfortable, unsmiling, as if he were unexpectedly roped into the handshake by Raul joining the hands of Santos, “Timochenko” and Raul. Colombian former president/now Senator Alvaro Uribe and his Centro Democratico political opposition party complained that this, in their view, apparently or by implication put Pres. Santos and “Timochenko” on the same level and supposedly bestowed “legitimacy” in an unnecessary and undeserved way to the FARC, when the FARC has yet to lay down its weapons. Pres. Santos denies this. But, the international humanitarian diplomat observed, the public handshakes between the top leaders of negotiating sides—like the now famous or infamous (depending on one’s point of view) three-way handshake together by an unsmiling Pres. Santos, the FARC’s smiling “Timochenko” and a beaming Raul Castro at the Havana ceremony last September 23—usually come after the signing of an overall agreement at the end of negotiations. Paraphrasing what an American university academic wrote to me: What is there now to top that?